Maine Mendoza and Alden Richards Now Together in Real Life? While the kilig intensity has yet to vanish for AlDub fans from Maine’s Event on Eat Bulaga, many of them are now going giddy over photos revealing the AlDub loveteam is in Boracay. Known to be beach lovers, Alden Richards and Maine Mendoza are spotted together in the lovely island. 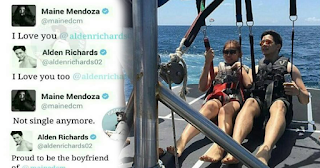 It has been viral news that Alden Richards rented a private plane in order to surprise Maine Mendoza in Boracay. Maine is on the island with her friends as they were celebrating a post-birthday celebration. The actor and co-stars of Kalye Serye decided not to take the regular flight so that Maine would really be stunned of his surprise. Netizens claim that Alden gave a colorful meaning to Maine’s birthday celebration. It was one of the firsts that she is experiencing with him. 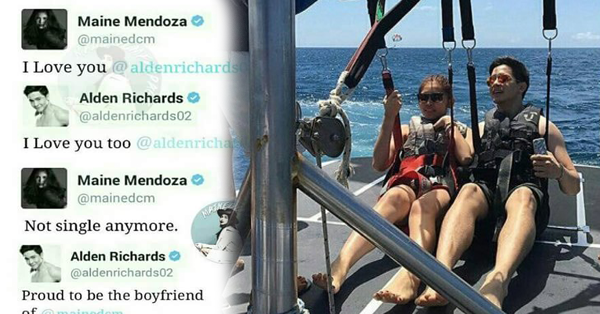 A fun Boracay vacation was followed by sweet tweets between Maine and Alden. In the photo, Maine and Alden are exchanging sweet words with each other. Check out the photos shared online and meaningful tweets from the couple and from those closest to both of them.